Models are placed on a stage and lighted, a backdrop image is added, stage looks are composed. Moving a light or changing a color is as simple as clicking and dragging a light icon or a color swatch. Recorded scenes can be assigned fade times, then played back at full screen size and recorded as QuickTime movies. Images can be printed, or exported for use in other graphic applications. 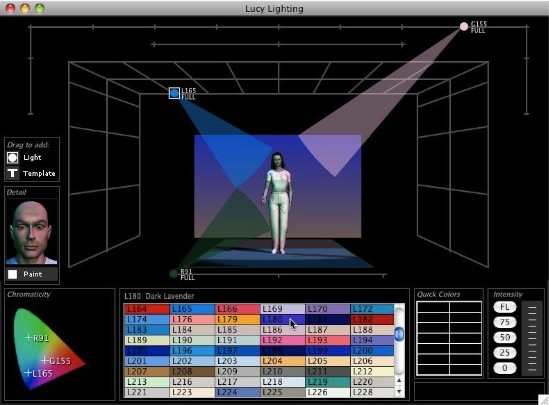 Interactive communication of lighting concepts to directors, choreographers, clients. Read press reviews and user comments about prior versions of Virtual Light Lab. Purchase Virtual Light Lab. Individual, student, faculty, and site license pricing. Download the demo version for Windows or Mac and test drive it yourself. Macintosh: OS X 10.2.6 or later, 800x600 display, QuickTime. Works on Intel or PowerPC Macs. All windows are sized to look great on 800x600 resolution classroom projectors.